Physical activity breaks are associated with improved attention, improved concentration and improved academic behavior. College can be stressful. Stress will always be part of life, so the key question is: how will you respond to it? Researchers at the University of Nevada, Las Vegas (UNLV) studied one strategy to help you handle stress during college: physical activity (1). The researchers conducted a 3-day program called “Fitness4Finals” (F4F), which focused on increasing the physical activity of college students during final exams. The goal of the program was to reduce stress levels associated with final exams. The program included light, moderate, and high intensity exercises. The light intensity exercises included yoga, Pilates, Thai-chi (50 minute duration). Moderate intensity exercises included 50 minute fitness walking, 10-30 minute stair climb, and 4 minute Flash mob. High intensity exercises included 50 minute boot-camp, 50 minute cardio-boxing, and 1.5-5 minute obstacle course. The students participated in at least one of these exercises every day for 3 days. Researchers examined the change in perceived psychological stress (PPS) of students before and after F4F events. The results revealed that the program was effective in lowering perceived stress of participants. However, physiological measures of stress were not significantly different. Being active can be beneficial on many levels, including improving academic performance (2), mental health, social health and physical health (3). You can receive these benefits from any type of physical activity, including fitness walking, jogging, stair climbing, boxing, Pilates, Thai-chi, swimming, and playing basketball, tennis, football. 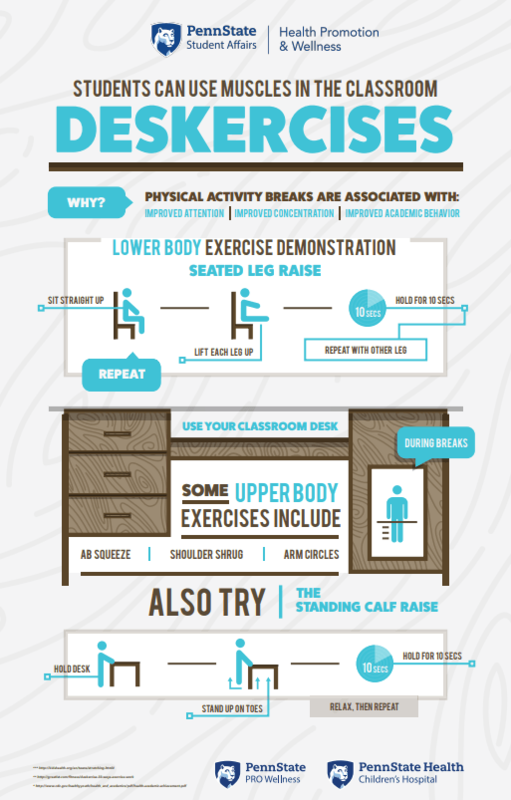 You can make physical activity fun by discovering the exercises you enjoy the most! College can be stressful, especially during finals. One way to manage stress is by being active. As one of the participants of F4F stated, physical activity can give you an opportunity to clear your mind and relax, which will help you concentrate better during studying. Next time you feel stressed, take a walk or play basketball! Koschel, Tessa L., John C. Young, and James W. Navalta. “Examining the Impact of a University-driven Exercise Programming Event on End-of-semester Stress in Students.” International journal of exercise science 10.5 (2017): 754. Salas CR, Minakata K, Kelemen WL. Walking before study enhances free recall but not judgement-of-learning magnitude. J Cognitive Psychol. 2011;23(4):507–513. de Vries JD, van Hooff MM, Geurts SE, Kompier MJ. Exercise as an intervention to reduce study-related fatigue among university students: a two-arm Parallel randomized controlled trial. Plos ONE. 2016;11(3):1–21. What is the Wellness Suite? The Wellness Suite is located in 020 IM and offers a variety of services and houses both the Center for Fitness and Wellness (CFW) and Health Promotion and Wellness (HPW). What services are offered at the Wellness Suite? The suite is divided into two areas. HPW (part of Student Affairs) offers wellness services and the nutrition clinic in this section of its space. Students from the peer education program, HealthWorks, conduct the free wellness services. As a student you can sign up for services on these topics: Healthy Eating, Physical Activity, Sleep, Stress, Healthy Relationships/Sexual Health, and Financial Wellness. Each service consists of three, one-hour session over a three week period. These services are open to all Penn State students and are a great opportunity to take a step towards making healthy lifestyle changes! You can also schedule a nutrition clinic appointment with a registered dietitian. The suite includes a relaxation room with adult coloring books, biofeedback software, and other calming features such as zen gardens and relaxation soundtracks. During the gray winter months, you can use a light therapy box in the relaxation room. All are welcome to come unwind! Wellness services and nutrition clinic appointments are free. The CFW is part of Kinesiology and offers fitness testing. The CFW peer interns conduct fitness assessments and blood lipid/glucose testing. The fitness assessment consists of body composition, VO2 max bike test, push-up, curl-up, and flexibility tests. Several of the Kinesiology fitness classes (e.g. 061, 093, 201) require students to complete fitness and blood testing, but any student is welcome to make an appointment! The fitness assessment takes ~45 minutes and costs $13.27 and the blood testing is $29.76. How do I sign up for HPW Wellness Services? Choose a service that interests you! How do I sign up for fitness testing with the CFW? Exercise is Medicine on campus (EMOC) is a global health initiative that promotes exercise as a way to decrease chronic disease. Exercise is Medicine is designed to increase physical activity and use exercise as the best ‘medicine.’ Every year in October, Penn State’s Kinesiology department organizes a week-long series of events to spread the word about how exercise can improve the well-being of Penn State students and employees. 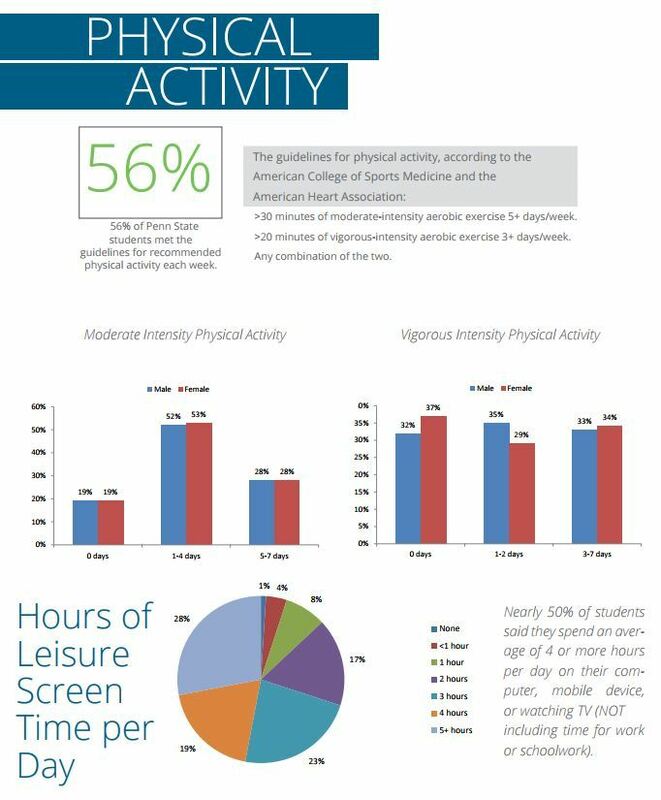 Based on the Penn State Health Assessment, 56% of students are meeting the national guidelines for aerobic exercise (1). However, 50% of students report spending 4 or more hours per day on their computer, mobile device or watching TV (not including time for work or schoolwork). There’s still work to be done, which is why this is a great campaign to get people moving! Health is wealth. Keep moving Penn State. If you feel like a walk in a park is all you need to feel physically and mentally better, then you might be right! 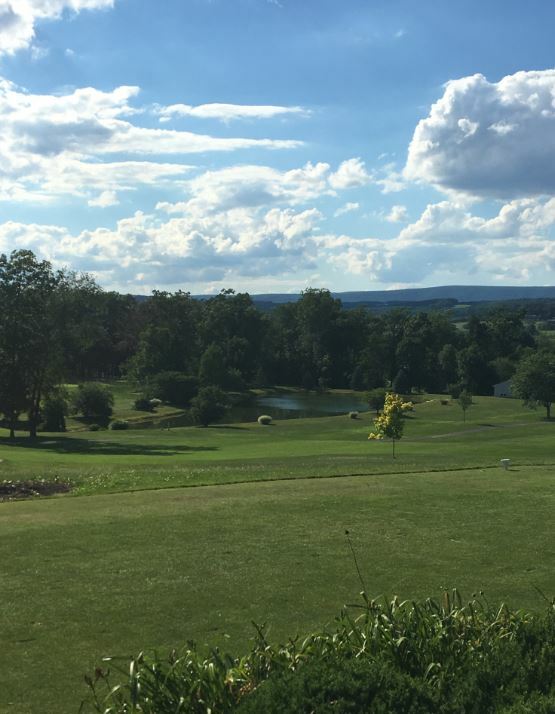 In a study conducted by Andrew Mowen and other Penn State researchers, it was shown that the vast majority of Pennsylvanians view parks as a valuable place to promote overall health and wellness, and as a critical part of primary health care. These results were based on two surveys; one was sent out via mail to a random sample of 12,000 adults and the other was conducted with outpatients at a medical clinic run by Penn State College of Medicine. Kick your hiking up a notch and try out rock scrambling. This fun blend of hiking and rock climbing is a great total body workout that improves cardiovascular health, strength, and flexibility. For more fun activities and local outdoor events check out onlyinyourstate.com (1) to see all your state has to offer. Check out Penn State Adventure Recreation for all of your adventure needs! Penn State’s Exercise is Medicine on Campus program (EiM-OC) recently received gold-level status from the American College of Sports Medicine (ACSM). By actively implementing physical activity as a vital sign of health, Penn State EiM-OC was awarded gold level recognition at the World Congress meeting in May 2017 (1). EiM-OC aims to improve the health and wellbeing of students and faculty through physical activity. The initiative encourages physical activity as part of everyday life and overall health. At Penn State, EiM-OC initiatives include campus walks, push-up challenges, classroom presentations and promoting campus health services & fitness centers on social media. Every year in October, Kinesiology students and faculty spend a week at locations around University Park engaging the campus community in exercise and general physical fitness. The outcomes from the 2016 EiM week are available on Penn State’s EiM website (2). Penn State EiM was founded in 2012 and awarded silver status in 2015 and 2016. Dr. Melissa Bopp, associate professor of kinesiology, and Zack Papalia, EiMOC coordinator, hope to reach even more students and increase the impact on the Penn State community in 2017-2018.